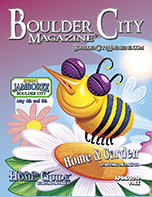 Boulder City Magazine® is a monthly publication full of information about Boulder City. We feature interesting and informative articles that offer an insight into what Boulder City is all about. Our goal is to keep the residents of Boulder City informed and entertained, as well as to introduce visitors to the delights Boulder City has to offer. This web site provides our internet visitors an opportunity to look at our Current Issue, as well as several of our Past Issues. Boulder City Magazine® is a free publication that can be delivered to your home. It also has valuable Advertising opportunities. Contact Us to find out more. Each month, Boulder City Magazine® publishes a new and exciting cover story of interest to locals and visitors. We also spotlight a Boulder City business in each edition to heighten awareness of our wonderful local service and retail assets. Local authors lend their expertise in such areas as computers, recreation, law enforcement, literature, travel, law, history, the arts and political updates. The Boulder City Chamber of Commerce offers residents and visitors useful information about local events and Chamber happenings. Boulder City Magazine® offers these quality monthly articles for the information and pleasure of our readers. Boulder City Magazine® also features the Boulder City Home Guide®, a concise and informative real estate guide to Boulder City and Southern Nevada. Find out more information about our local Realtors. Every month we print 8,000 copies of Boulder City Magazine®. A copy is mailed to every residential home in Boulder CIty and 2,000 copies are distributed through various business locations around town. We offer one of the best advertising deals in Boulder City. Starting as low as $2¢ per magazine, you can have your business represented in Boulder City Magazine® in a full-color, quality display. Why not join our many advertisers in presenting your business to the Boulder City community, either through our publication or our web site. Contact Us to find out how!